The Kadia Dungar caves are a growing popular cave sight in Gujarat. It is located in Bharuch nearing the city of Vadodara in Gujarat. The Kadia Dunga caves summit the major caves with Buddhist connections in well known Gujarat. The Kadia Dunga caves were earlier used as viharas as one can conclude from its shape. Tourists can also visit the Brick Stupa at the lower foothills near to the caves. The caves are carved out from rocks portraying the flourished architecture of the old era centuries ago. The caves are cut out from seven rocks making it a must watch travel attraction in Gujarat. The ancient rock caves were an earlier sign of Buddhism spreading in India. From the era when religious Buddhist preachers would scout places in search for inner peace the Kadia Dunga caves stand erect since then. The caves hold enormous religious value even to this day because of the history surrounding it. It is said that the earliest Buddhist followers would meditate in these caves and also reside in them. Its detailed construction is also a proof of its religious usage. The caves still hold that cool atmosphere inside them which the tourists can experience. 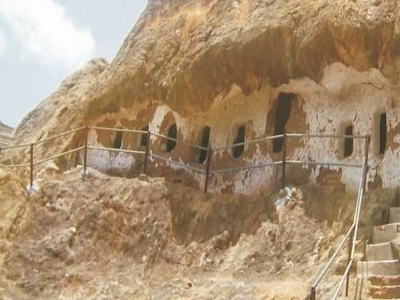 The Kadia Dunga caves are an integral part of the Buddhist caves group that is located in Gujarat making it an interesting tourist region in India for its historical worth. The place is ideal for tourists who prefer a quick day out between ancient history. The caves were in active usage in and around the 1st century. The caves are reputed and known for its rock cut lion pillars that are a huge attraction. Visitors can experience the old Buddhist charm in these caves as these were used by Buddhist dwellers. The strong Buddhist connection that the Kadia Dunga comes with makes it a strong recommendation for people from any religion making it a hotspot tourist destination in Gujarat. The caves can be easily accessed from Vadodara as the city is well linked with other parts of the state of Gujarat. The nearest railway station and airport is available at Vadodara and one can hire private cars or use public transport to reach the caves. The caves are atop a hill with the area being spread pretty generously. The Kadia Dunga caves makes the town of Bharuch brimming with travelers during Buddh Purnima as people from all around the world makes it must visit.